A rare collection of century old Canadian gold coins is quickly selling out. The Royal Canadian Mint in November began selling 1912-1914 $5 and $10 gold coins produced at the Ottowa branch of Britain’s Royal Mint, now the Royal Canadian Mint. These coins were originally minted at the time as part of the facility’s mandate to convert Canada’s growing gold resources into circulating coinage. Then, as the country entered World War I a few years later, it was decided to keep the gold coins out of circulation to build on the government’s gold reserves for financing the war effort. Accordingly, only a few of them had ever made it into the hand’s of collectors. The remaining stockpile has been stored at the Bank of Canada for over 75 years as part of the Government of Canada’s Exchange Fund Account. 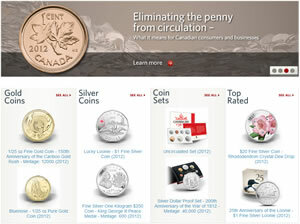 Now, hand-selected examples of the 1912-1914 $5 and $10 gold coins are on sale through the Royal Canadian Mint. Lower quality examples are to be melted down with all proceeds being converted to quality fixed-income securities. 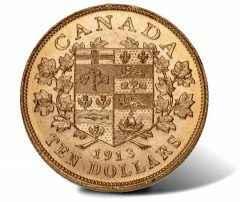 "The 1912-14 $5 and $10 Canadian gold coins are at the source of the Royal Canadian Mint’s reputation as a world-class refiner and producer of gold coins and we are delighted that these pieces of our history are back in the spotlight after a nearly century-long absence," said Ian E. Bennett, President and CEO of the Royal Canadian Mint. 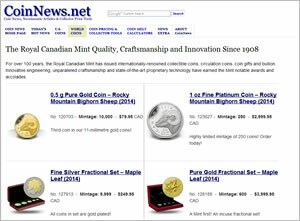 "By creating this unique opportunity to purchase Canada’s first gold coins proudly displaying national emblems, the Mint is excited to share these important artefacts with Canadians and collectors world-wide with the help of the Bank of Canada and the Department of Finance." The strikes are made of 90% pure gold with major sourcing attributed to the Klondike region for the 1912 gold coins and Ontario for the 1913-1914 gold pieces. A shield bearing the Arms of the Dominion of Canada in a wreath of maple leaves is shown on reverses of the coins. Surrounding inscriptions include the year of issue, face value and CANADA.Obverses bear the effigy of the newly crowned Sovereign King George V.
According to the Mint, about 245,000 King George V $5 and $10 gold coins dated 1912, 1913 or 1914 were held by the Bank of Canada. Of those, 30,000 were hand-selected for sold to the public. Those six denominations produced from 1912 to 1914 are available in a single set as well as individually. Many of the single gold coins have sold out. Due to limited quantities, they may only be ordered directly from the Mint at www.mint.ca/1912gold, or by calling at 1-800-267-1871 in Canada and 1-800-268-6468 in the US. Incredible! Any more goodies like these stashed away in government vaults somewhere? How about left over US gold coins in bags of 1000 at Ft. Knox or some forgotten storage room in the basement of a federal reserve branch? Ordered $10 gold early December End January not in no notice, can’t get through to RCM by phone. It is terrible that these historic gold coins the are not “hand selected” are being melted. These coins are still worth more much more than melt value, even if their condition is not so perfect. Shame on the RCM for melting these historic coins.